Military is the ultimate template in menswear – clothes designed for function that are both beautifully utilitarian and with more specialist pieces, plain weird when put in civilian context. As design goes, these performance (and ceremonial) clothes are dangerously close to perfection. 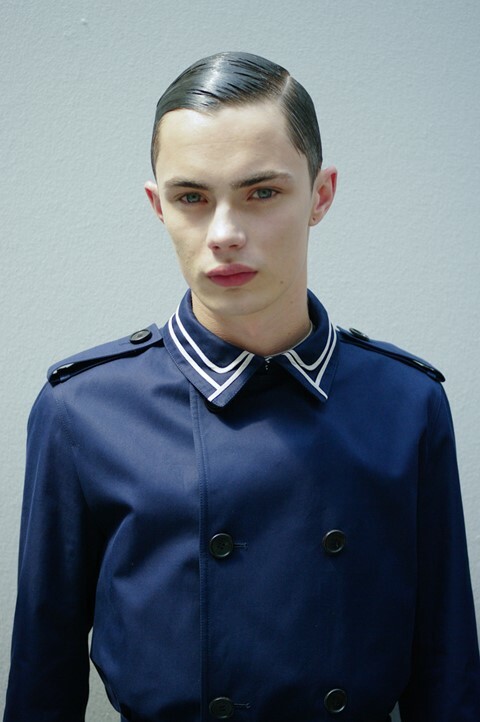 Dior Homme's Kris Van Assche might agree – he is working his way through the various forces, if this navy blue collection is anything to go by, even down to the regulation neat side-parting. An intuitive follow-up to last season's army green work out, nothing says summer more than being at the sea on an impressive ship. Though in line with the signature rigour you'd expect from this designer, this story has nothing to do with lounging on a yacht off Ibiza. Silver buttons punctuated shoulders and closed (sleeved or sleeveless) double-breasted tailoring, whilst breton stripes became upgraded in a multitude of colourways to create this season's Dior Homme uniform.